TC Economic Development & Ecosystem Leaders Met with the New President and the VP of University Relations of MTU. 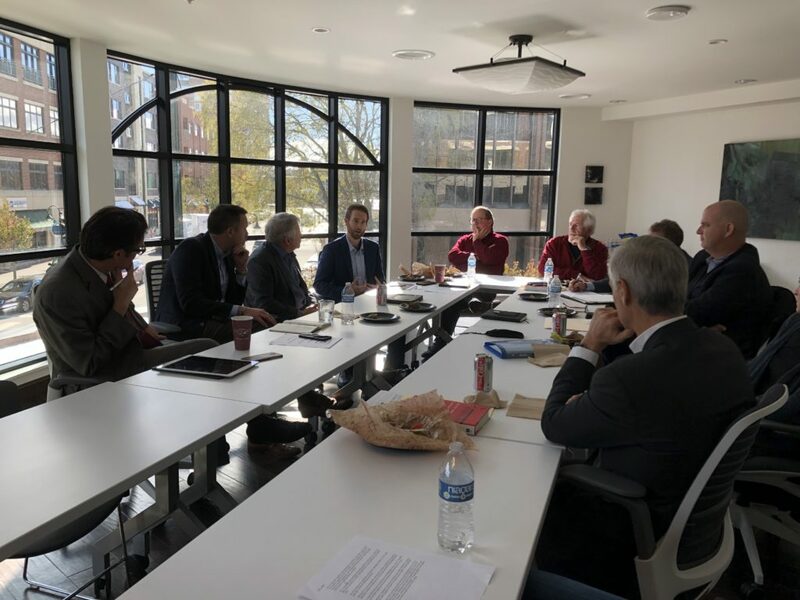 Present: Boomerang Catapult, GTAMC, Traverse City Chamber of Commerce, TC Connect, 20 Fathoms, Newtons Road, GTEDC, TC New Tech. Purpose: We met to introduce our missions, activities and strategies to help MTU better understand our region’s culture, activities, goals and discuss fit. We have been continuously growing our relationship with MTU and exploring where and if we fit together. Just like any relationship, it is important to make sure that our DNA is compatible. When asked about challenges that we face as manufacturers in or region we discussed how difficult it is for us to live in a world of duality in order to optimize today and build tomorrow at the same time. We seem to be caught in a spiral of focusing on operating efficiency metrics and struggling to connect with Industry 4.0 and create a vision for tomorrow. This is where we need help, to continue to be innovative in our products and services in order to support the new “On Demand” style of customer requirements. Our region is hungry for a partner that will help build an innovative looking tomorrow and eager for a University to break ground, but I think the pace at which we are traveling and the strategy that we are following is wise to be sure that the fit is certain. Our next step as manufacturers is to begin developing a relationship with the functional department leaders of MTU and explore what needs can be addressed by Michigan Tech. If we want to get more traction, we must be able to articulate our needs, so the onus is really on us at this point because Michigan Tech is ready to listen. Stay tuned for a special meeting devoted to this subject. Overall, the result of the meeting was very positive. The President of MTU gave a speech at dinner with positive remarks about our entrepreneur culture, our high energy, the similarity of our DNA and the appearance of a good fit between MTU and the Grand Traverse Region. A special thanks to Casey Cowell, Bill Myers, the rest of the Boomerang Catapult team and all of the passionate leaders of our region that are bringing their voices to the table to help make this happen for our beautiful region.